The PNG Liquified Natural Gas (LNG) Project is an integrated development that includes gas production and processing facilities in the Southern Highlands, Hela, Western, Gulf, and Central Provinces of Papua New Guinea. There are over 700 km of pipelines connecting the facilities, which includes a gas conditioning plant in Hides, and liquefaction and storage facilities near Port Moresby, with a capacity of 6.9 million tonnes per year. The project was announced in December 2009, and in early 2010 construction work began. The project commenced production of LNG in April 2014 (ahead of schedule) and completed the first shipment on 25 May 2014, a historic moment for the project. The project will provide a long-term supply of LNG to four major customers in the Asia region, and has the potential to transform the economy of PNG. The benefits from the project have the potential to lift up the economy as the government applies the earnings of the project to improve the quality of life of Papua New Guineans. Talks are already underway with plans to possibly expand the LNG plant to be completed by the end of 2017. The Lihir operation on Niolam Island in the New Ireland Province of Papua New Guinea is 100 percent owned and operated by Lihir Gold Limited (LGL). The gold deposit is within the Luise Caldera, which is one of the world's largest known gold deposits. In the financial year ending on 30 June 2014, Lihir produced 721,264 ounces of gold. Since production commenced in 1997, the site has produced more than 9 million ounces of gold. Lihir creates economic value for Papua New Guinea and local people through operations, investments, and support. Approximately 5,000 people are employed at Lihir, with 90 percent of employees from Papua New Guinea. More information is available on Newcrest's website. Ok Tedi Mining Limited (OTML) is a privately held company that operates an open-pit copper, gold, and silver mine located in the Star Mountains of Western Province in Papua New Guinea. OTML is a 100 percent state owned entity with 87.8 percent direct shareholding by the government of Papua New Guinea and the people of Western Province holding a 12.2 percent interest. 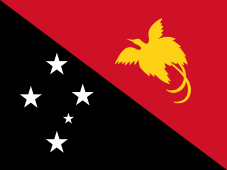 The company's earnings contribute much to PNG's GDP. In addition to its monetary contribution, the mine is also directly involved in PNG's development through infrastructure projects such as health centres, schools, houses, roads, airstrips, jetties, water supply, and communication systems. Papua New Guinea has one of the largest fisheries zone in the Pacific and is blessed with abundant marine resources which covers an estimated area of around 2.4 million km². The coastline and offshore archipelagos present a great diversity of coastal types and marine environments. The Gulf of Papua is characterised by large delta areas, mud flats, and mangrove swamps, while the north coast and high island coasts are typified by fringing coral reefs and narrow lagoons. Some of the smaller island clusters lie adjacent to extensive submerged reef systems, or broad shallows. PNG's total coastline length of approximately 17,000 km includes about 4,250 km (25%) of deltaic flood plain/lagoon systems, while some 4,180 km (24%) of the coastline occurs around islands and atolls. PNG also has fast- and slow-flowing rivers, over 5,000 lakes, and an extensive system of marshes. PNGss small-scale fisheries reflect the diversity of the countryss coastal environments. Along the mainland, high island coasts, and in the smaller island communities, fishing activities include the harvesting of the reef flats, spear fishing, shallow-water hand-lining from dugout canoes, netting, and trapping in the freshwater reaches of the larger rivers. In the swampy low land areas net fisheries for barramundi, catfish, and sharks can be found. While in the Gulf of Papua and parts of the Northern Islands Region, there are also village-based lobster fisheries. Collection of invertebrates (bêche-de-mer as well as trochus and other shells), both commercially and for subsistence purposes is extensive, and may exceed fin fish harvesting. Commercial prawn-trawling operations take place in the Papuan Gulf and other parts of southern PNG, and a small-scale tuna longline fishery has been established. A handful of vessels are now successfully catching sashimi grade tuna and exporting them to overseas markets by air. Your best source of infomation on the fishing industry and related subjects would be to contact the National Fisheries Authority (NFA) on (675) 309 0444. For those interested learning about the fishing industry in PNG, the Naional Fisheries College located in Kavieng has regular training courses covering all aspects of the fishing industry: from catching fish to downstream processing. They can be contacted on (675) 984 2187 or you can visit the National Fisheries website for more information. The largest fishery in both catch quantity and economic terms is the tuna industry which is found throughout PNG's fisheries zone. The tuna fisheries in the western and central Pacific Ocean produce approximately half the world's tuna and is of high economic importance to Pacific island countries and territories. The purse seine fleets operating in Papua New Guinea waters are one of the largest catching, mainly skipjack and yellow fin tuna, with a smaller catch of big eye tuna and other non-target species. Tuna from PNG is exported in the form of fresh, chilled, canned, fishmeal, and frozen. The potential market value is about K1 billion depending on the commodity price with an export value well in advance of K200 million. Tuna is found throughout the PNG fisheries zone but especially to the north and east. As tuna are a migratory species moving from area to area depending on climatic and environmental conditions, the quantity found in the PNG zone may significantly vary anually. The NFA of PNG implements an observer program that offers the opportunity to document levels and variability of catches of non-target species in the tuna purse seine fishery. In recent years, a number of licences have been granted in conjunction with onshore investment in canneries in Madang, Wewak and Lae. The loining plant and cannery in Lae operated by Frabelle (PNG) Limited currently employs and trains a workforce of just over 1,000 national staff. The company sells fresh sliced tuna, tuna steaks, tuna for sashimi, and reef fish. Their canned tuna is labelled under the brand name "Isabella Tuna". The International Food Corporation (IFC) cannery in Lae specialises in gourmet quality tinned tuna and mackerel for supply mainly to PNG's large domestic market. Their products are labelled under the "Besta" brand name, the company produce a wide variety of styles and flavours. RD Tuna Canners Ltd. and RD Fishing PNG Ltd located in Madang are fast becoming strong pillars to the economic advancement of the Madang region and development of the tuna industry in Papua New Guinea. Both companies are the first and only integrated tuna fishing and canning operations in Papua New Guinea. The operations of the two companies are governed by a 20 year agreement signed by RD and both the independent state of Papua New Guinea and the provincial government of Madang. A small but growing domestic longline fishery has also been established catching 2,000 to 3,000 tonnes of fish in recent years. Due to its position south of the equator, Papua New Guinea falls within the moist tropical rainforest zone. This position accounts for the high average annual rainfall that occurs. This high rainfall influences vegetation to a large extent, making PNG a lush green country. Despite the high average rainfall, there are still parts of the country which receive less than the country's average of 3,000 mm per year. Within these six classes, there are a further 59 classes which have been differentiated by the PNG Forest Authority. There are estimated to be between 15,000 to 20,000 higher order plant species of which over 2,000 are tree species. Over 400 of these species are utilised in one way or another including, but not limited to: harvesting for commercial use, such as timber production or log exports. Some of the main commercial tree species that are exported are: Homalium, Pometia, Calophyllum, Eucalyptus, Terminalia, Dillenia, Toona, Buchanania, Canarium, Anistoptera, Endospermum, Octomeles, Instia, Syzgium, Celtis, Burckella, Mastixiodendron, and Dracontomelont. In Papua New Guinea, forest resource ownership is unique unlike many other parts of the world. This ownership is closely associated with a land tenure system, where land is owned and managed by customary landowners (tribal clan groups). It is estimated that 95% of the total land area of the country is customary owned. Due to this land tenure system, forests that grow on the land is by default "owned" by the clans and tribal groups. In order to carry out any forest related operations such as harvesting of timber or reforestation, extensive consultations must take place between the state agencies including the PNG Forest Authority and the landowners. During the last twenty-eight years the forestry sector has contributed immensely towards the national economy, and overall economic development in rural areas. As a result, infrastructure development in rural areas has increased. Land owners benefit from forestry projects in the form of royalties and premiums while the national government benefits through export tax and foreign exchange earnings. The Monitoring and control of all forest operations is the responsibility of the PNGFA. One of the main aims of the PNGFA is to ensure the sustainable management of Papua New Guinea's forest resources, so that it is used wisely for the present and future generations. These activities are controlled by the Forest Policy. The policy ensures that forest resources of the country are used and replenished for the colelctive benefit of all Papua New Guineans. The national government owns and manages several pine plantations that operate under sustainable forestry guidelines. These plantations are located in the Bulolo Region of Morobe Province. PNG Forest Products (PNGFP) has developed into an industry leader and pioneer in helping build a better Papua New Guinea. PNGFP uses 100% renewable plantation pine harvested from the the "Golden Pine" plantations of the Bulolo Region. Their product range includes: prefabricated houses, dressed timber and mouldings, treated power poles, export grade plywood, and veneers. As the mainstay of the economy, Agriculture is a key component of the renewable resources sector. It sustains the livelihood of more than 85% of Papua New Guineans. The Agriculture sector employs over 25% of the workforce in the formal sector, it also contributes 15% to foreign exchange earnings and 23% of Gross Domestic Product. It provides markets for industries and the service sector, and is a source of capital, labor and products for the other sectors. Agriculture is also a sector with substantial untapped potential, the current expansion in the minerals sector and the new PNG LNG Project, there is a real need for quality local fresh fruit and vegetables available for purchase in many parts of the country. Food crops account for more than 50% of the total agricultural output, and only about 25% of the produce is marketed. The driving force for subsistence production is made of about 850,000 smallholder family farms. The main agricultural export components include coffee, oil palm, copra, copra oil, cocoa, tea, and rubber. Other supporting components such as sugar, spices, and livestock farming are being exported. The tree crop sub-sector, which is exclusively export oriented, is based on coffee, cocoa, coconut, oil palm, tea, rubber, and some alternative crops. At present, estates and plantations provide 40% of all coffee, 30% of coconut, and 38% of cocoa grown in PNG. Coffee is the highest foreign exchange earner for Papua New Guinea, the majority of which is grown in the Eastern Highlands Province, and Simbu. An estimated 87,000 hectares of land is currently being used for coffee cultivation, with the majority of the coffee grown in the highlands. Approximately 2.5 million people are employed in the idustry, with the majority being smallholder farms. These smallholders produce mostly organic coffee. PNG cultivates two types of coffee: arabica and robusta. Arabica forms the majority of coffee exports and is grown mainly on the highlands. Robusta coffee is grown in the lowland regions and forms about 5% of coffee production in Papua New Guinea. Vanilla is a new promising crop that has come on board in Papua New Guinea's export industry. Vanilla comes under the umbrella of the Spice Industry Board of Papua New Guinea which looks after the other spices of cardamon, chilli, and pepper. Most vanilla in PNG is cultivated in small family farms unlike the large industrial complexes found in Madagascar. PNG production runs at about 150 tonnes a year, making it probably the world's third largest producer, and is one of the few regions in the world that grow both the Planifolia (Bourbon) and Tahitensis (Tahitian) species. Although relatively a new player in the world market the vanilla exported from PNG is regarded as an 'A' grade product, being very high in quality, taste, and aroma. PNG vanilla can be classified organic as no chemicals are used in its cultivation. In line with its Export Driven Strategy, the government is determined to add value to the vanilla industry. The government will consider providing incentives to investors who propose to add value to vanilla that is currently being exported unprocessed. The growth of the vanilla industry in Papua New Guinea has resulted in major improvements in the living standards of village people. Palm oil is the largest agricultural export industry in PNG basically double that of coffee which is the second largest. Oil Palm is the most important crop in PNG in terms of export income (over K1,000 million). Palm oil export directly supports over 18,000 smallholders and drives the cash economies of the provinces in which it is grown. Relative to the performance of other tree crops, oil palm is an ongoing success story. It boasts one of the highest yields in the world. Crude palm oil production has been steadily on a increase. Oil palm is grown in five provinces. In each area there is a plantation company with associated smallholders growing oil palm. The oil palm industry in PNG has put a high priority on environmental sustainability, demonstrated by the participation of all PNG growers and millers in the Round Table on Sustainable Palm Oil (RSPO). This project brought together industry and research staff to define the main environmental sustainability issues for oil palm cultivation in PNG, and to provide recommendations for research and development that will improve sustainability. The coconut industry is the oldest agricultural industry in PNG, and since the 1950's has played a major role in fostering economic development in lowland areas. Copra is a source of income for around 40 per cent of the people living in coastal mainland and island areas. Coconut palms account for between 250,000 and 265,000 hectares of land in PNG. This area appears to have changed little since the early 1970s accounting for up to 5 per cent of arable land in PNG.